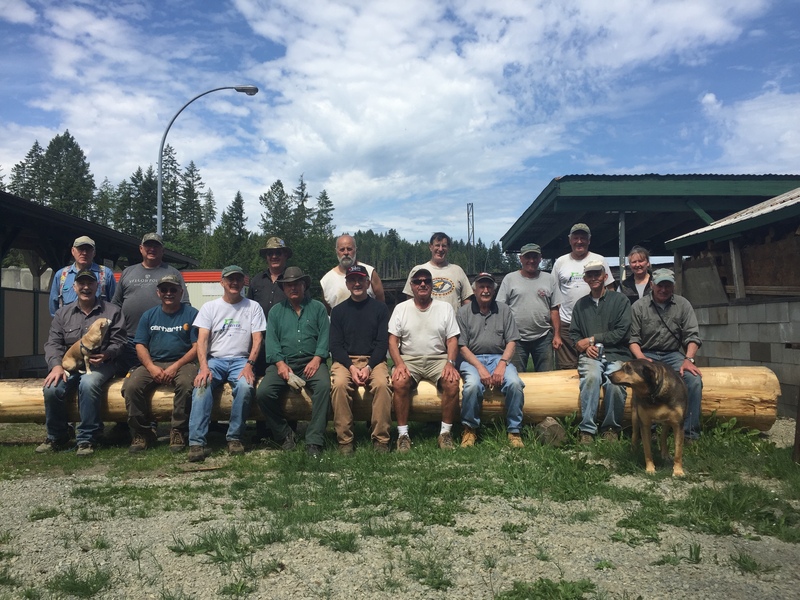 Many Thanks go out to the Broom Busting Crew for their hard work and dedication in controlling the spread of broom on Nanaimo Fish and Game Protective Association (NF&G) property. The function of trying to prevent the NF&G property from being over taken by this stubborn and invasive plant is a long ongoing project. Left unchecked it displaces native and beneficial plants, causing loss of grassland and open forest. It aggressively spreads to form mono-cultures, replacing desirable forage grasses and young trees. Seeds are toxic to livestock and horses. The logging of the property has created an ideal environment for the Broom to propagate and efforts must be made to keep it in check until such time as the forest is re-established. This project, like many undertaken can only be managed and maintained with the dedication and efforts of member volunteers. Sad to say but the NF&G like many other organizations is suffering from a lack of volunteers to man the many projects and functions required to ensure the longevity and possibly, future of the association. Quite simply the annual dues we pay do not cover off all the costs of running and maintaining an organization such as NF&G. Looking at the Broom Busters 2016 photograph, some not in the picture but in the kitchen or behind the camera, the faces are easy to recognize. You may not know the names but anyone who has been remotely involved with the NF&G may recognize them as – NF&G executives, the kitchen staff, grounds maintenance, painters, political liaison, directors, grant writers, purchasing agents, grant coordinators, function set up crew, range officer, cleanup crew, carpenter, event organizer, rental coordinator, and on and on……. These dedicated few wear many hats. The average age of the dedicated members in this photo is seventy plus, they have for many years been doing a great deal of the heavy lifting to ensure NF&G remains relevant and recognized as such within the greater community. The need for each of us to help out has never been greater than it is today and unless we as members step up will only become more evident with each passing year. Each member has a certain allegiance to a particular Division under the greater umbrella of the NF&G but must recognize that we are here and benefit greatly because of our affiliation with the greater organization. NF&G is most certainly more than the sum of the individual parts (Divisions) and as such needs the support of all members. One can volunteer and support a Division but hopefully would set time aside to volunteer in a function or work party, which is in the interest of the greater organization and may not appear to be of direct benefit to the Division. The Broom Busters and many others with in the NF&G would most certainly appreciate any and all assistance one could give. A great deal of time is not being asked for; quite simply a couple of hours per month on average would go a long way to easing the load and improving the health and ensuring the future of the Nanaimo Fish and Game Protective Association. The Nanaimo Fish and Game Executive is looking for assistance to remove Scotch Broom from the Property. Any and all help in this endeavor is greatly appreciated. Scotch Broom is an invasive species and as such is of great concern to the club and the effect it can have on our property. A work party is being set up for all those wishing to assist……. Saturday May 14 2016 at 08:30 AM. Nanaimo Fish and Game parking lot. Please bring any tools pruners, loppers, shears etc which you have available. The Executive of the Nanaimo Fish and Game Protective Society would like to thank you in advance for your help in this timely and important work party. 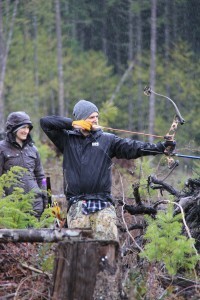 Local businesses support archery at Nanaimo Fish and Game Protective Society (NF&G). 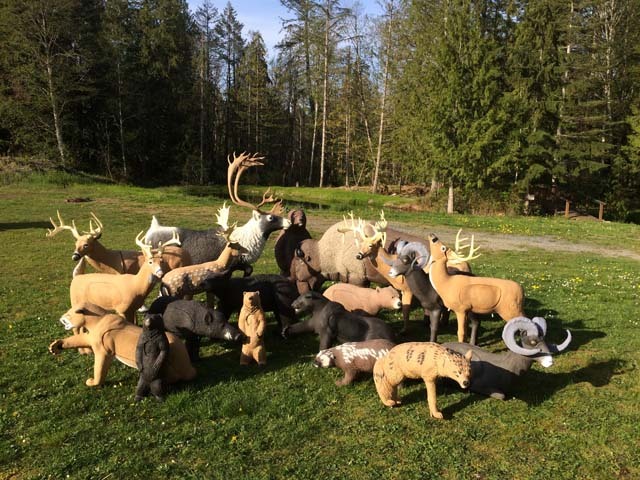 Last fall The Archery Division of NF&G launched a campaign asking local businesses to participate in a sponsorship/ partnership with NF&G by purchasing a 3D target for use in our archery program. The response was over whelming. We would like to thank all those that have expressed their support by participating and ensuring the longevity of our archery program. The following local businesses, organizations and individuals stepped up to show their support for the NF&G and more importantly to support sports in the our local community. Local 8 PPWC-Harmac Union, Copcan Contracting-Gregson Holdings, L’il Nib Lures, Nesvog Meats & Sausage Company, Milner Trucking Excavating & Disposal, Nanaimo Toyota, Nanaimo Wine Shoppe, Mark’s Import Auto, Lairad Wheaton GM, Chinook Scaffolding Systems, Yellow Point Drywall Ltd, Pactow Transport Services, Harbour Chandler Ltd, Inter-Kraft Contracting Ltd, Hub City Paving Ltd, Terrrier Blades, Robinson Rentals and Sales, Woodgrove Chrysler, Grouse Nest Farms, Columbia Fuels Ltd, M Knight Construction Ltd, Baker Auto Supply Ltd, Aurora Roofing Ltd, Wholesale Sports Outdoor Outfitters and four anonymous donors. The buzz around the clubhouse Sunday morning was absolutely infectious, the smiles, laughter and friendly ribbing made everyone feel welcome and happy to be out enjoying the camaraderie. Standing amongst this jubilant crowd one could not imagine anything but a picture perfect day, blue sky, sunshine and warm breezes. The strength and future of Archery in our communities was clearly evident in the number and breakdown of the shooters in attendance. Women, men, seniors and youths, individual attending their first 3d shoot, groups of friends gathering together and entire families all coming together to test their skills in friendly competition. The turnout was more than a pleasant surprise with the final tally coming in at 114 shooters, an impressive number on its own but when you factor in the 14 cubs and 11 juniors it speaks volumes to the health of the archery programs in our communities. There was a short but informative safety meeting at 9 AM with all being very attentive. The course lay out was explained and the groups were given time to gather their gear and head for their appropriate station for the start. It was at this time that reality set in; it became clear the dress for the day was not going to be sun glasses and coconut tanning oil but rather rubber boots and Gore-Tex. The really chic came in their finest formal attire, a souwester and the ever reliable Black Diamond Tofino Tuxedos. As all headed out the inclement weather did not dampen the mood as all were still expressing their unfaltering optimism for an exceptional days shooting. Obviously archers are a hardy bunch as demonstrated. To see the contestants arrive in the clubhouse after the first round it was more of the same mood as expressed at the morning registration. Stories of wet feet, water proof hats that are not living up to their billing, cold hands, wet fletching, foggy glasses, water filled peep sights, rumours of flying fish… in no way deterred these hardy outdoorsmen ( women, men or the youth alike). The afternoon round was lighter in numbers than the morning with an unusually high number of requests for assistance and over looked errands that sadly needed immediate attention. The number of requests for hot tub testers, hot shower inspectors, and dry clothing models were over whelming and took its toll on the afternoon numbers. Archers being a very selfless group by nature many reluctantly withdrew from what was sure to be an enjoyable afternoon to help those in need and fill the voids. We applaud you all for your selfless acts of kindness. Puddles on the clubhouse floor from dripping clothing and gear emphasized just how wet and dreary the conditions on the trails were the entire day. This was in sharp contrast to the jubilant mood and high spirits of the shooters who fought through the conditions and completed the competition. A constant thread in the conversation amongst the contestant was the praise for a great event and a well laid out course. A huge THANK YOU goes out to all those that came out and supported the efforts of all those that helped stage this event. It is only through the dedication of the volunteers which give freely of their time that is it possible to put on a competitions such as this. The course designers, trail cleaners, registration personnel, kitchen help, clean up helpers and many more need to be acknowledged and thanked. Nanaimo Fish and Games next 3D Shoot will be the SUMMER CLASSIC June 11 and 12 2016 and this year will be bigger, better and MUCH DRIER…….. Hope to see you there. The Vegas Shoot, known as the largest and most prestigious indoor archery tournament in the World, attracts novice to Olympic archers from around the Globe and includes 3-intense days of no error competition. Dates for the tournament this year are January 29-31, 2016. This will mark the 50th Vegas Shoot since 1962, and to help celebrate 50 successful Vegas Shoots, attendance is expected to surpass 3,000 archers with thousands of spectators. 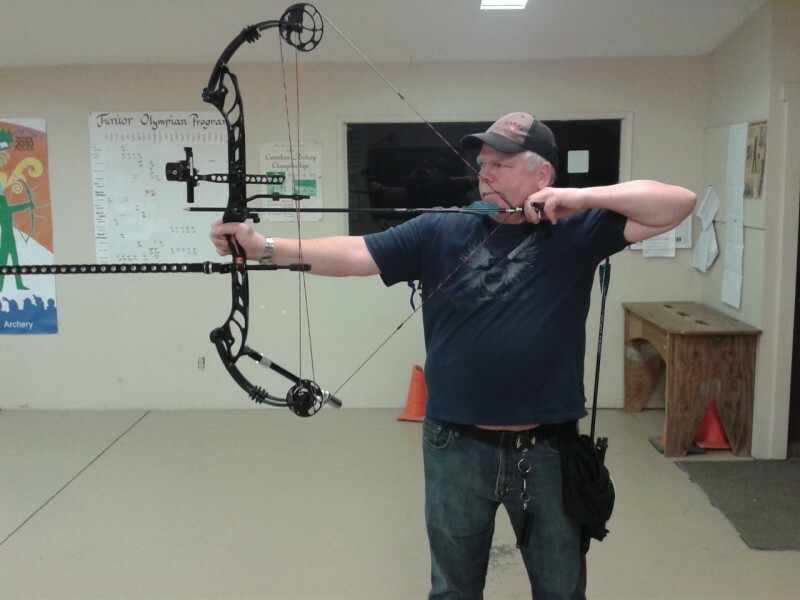 One of those 3000 or more competitors will be Nanaimo Fish and Game Associations very own Ron Tuson . Ron has attended the shoot a number of times in past years and is looking forward to the competition and 50th celebration activities. The weekend competition includes the traditional 3-spot 20-yard “Vegas Round” that made this tournament famous. 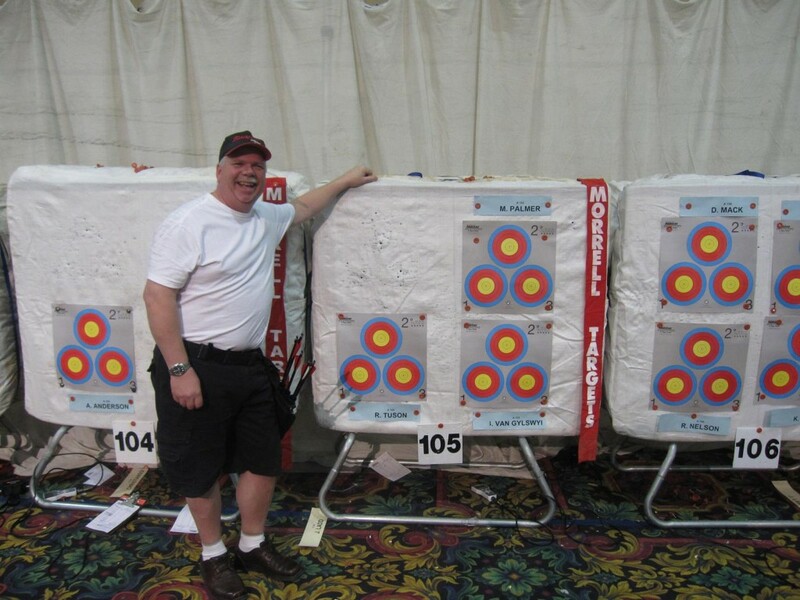 Target: All Championship (including Championship Young Adult) Divisions and Flight Divisions will shoot on either the 40 cm, “Vegas” three-spot target face with gold – red– blue (10-9-8-7-6) scoring areas or the 40 cm single spot face with 10 through 1 scoring rings. The x-ring of the 40 cm Indoor Vegas Face will be used for tiebreaks in the Flights divisions and for 4th place or below in the Championship divisions. Rounds: Each round on Friday, Saturday and Sunday will consist of ten ends; 3 arrows per end. 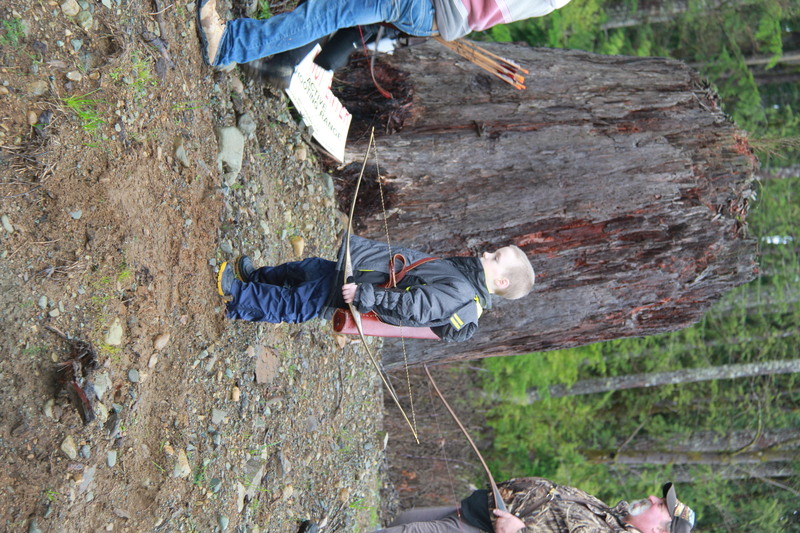 The Nanaimo Fish and Game Annual Turkey Shoot proved to be a very successful fund raiser. The Archery Division is very pleased with the participation and contribution to the cause through the 3D shoot. In light of the weather leading up to the event the turnout was nothing short of tremendous. 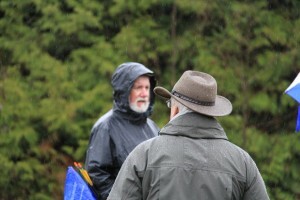 At final count 96 registered shooters came out to brave the elements and support the cause. The work (by dedicated volunteers) on the trail in the days leading up to the shoot showed the care and consideration given to the task. The trail was cleared and twenty targets were placed to challenge the participants. The word from the shooters on the trail spoke volumes as to how well prepared and laid out the trail was. The numbers and mix of the shooters is a testament to the strength and future of our sport. Over hearing conversations on the trail and seeing seasoned shooters sharing experience and providing guidance to the young and novice shooters speaks volumes s to how welcoming and open the archery community is. As this is the last shoot of 2015 hosted by Nanaimo Fish and Game we would be remiss if we did not recognize the efforts and hard work so generously given by our volunteers. It is only with the sacrifice and efforts of these individuals that the Nanaimo Fish and Game Protective Association is able to bring events like this to you. Wish Everyone a Very Merry Christmas and a Happy New Year. Generous donations changes a dream into reality. 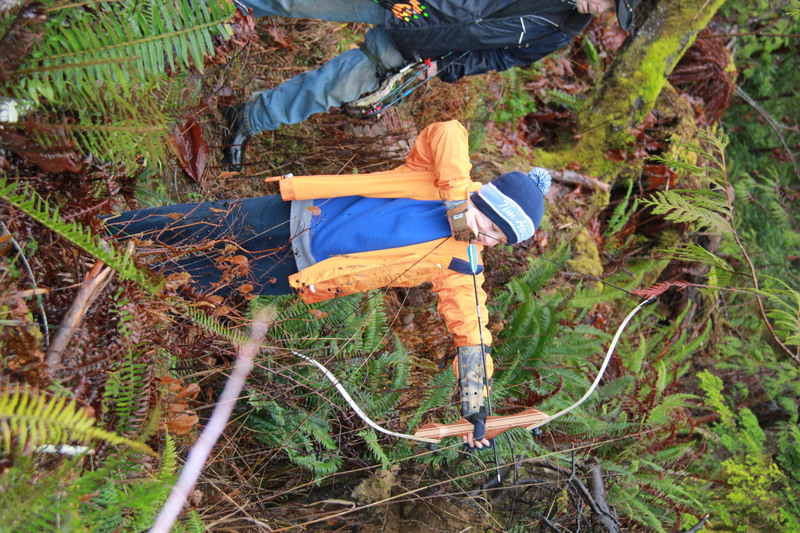 Generous donations from the forest sector are building dreams for a fast growing sport in Nanaimo—ARCHERY. Four forestry companies based in Nanaimo—Aggressive Timber Falling, Coastland Wood Industries, Dorman Timber and TimberWest—have donated five loads of second growth Douglas fir logs to build a new indoor archery facility over the winter for the Nanaimo Fish And Game Protective Association (NFGPA). Three of these four companies are Truck Logger Association (TLA) members—local small-to-medium sized forestry businesses providing jobs in Nanaimo. John Noble, a director of NFGPA, explained the design, “The building will consist of fourteen indoor lanes, bathrooms, work space and common room totaling 5600 sq. ft. of floor space plus an outdoor covered area.” He’s particularly proud of the versatility of the building. “This new indoor facility will be used for many functions and sporting events the Nanaimo Fish and Game puts on each year for our members and the community,” said Noble. This architectural drawing shows what the new facility will look like from the outside. Clint Parcher, Vice President of Fibre Supply at Coastland and a TLA Director, organized Coastland’s two donated log loads. “As a small company, we’re happy to support a volunteer run organization that many of our employees belong to and enjoy,” said Parcher.